The second preview for our annual Denver Beers Made By Walking Fest! Water, or a lack thereof, defines these two ranges. The effect is obvious to the eye. The scraggy and sparse scrub that grows in the Rockies couldn’t contrast more with the lush, burgeoning vegetation that explodes out from Appalachians. You can feel it too. Colorado air goes down like a light and crisp bitter, with a faint floral bouquet. North Carolina’s air is more like an American barleywine: heavy and sweet, carrying with it all the complexity of the myriad of wildflowers and tree varieties that grow there, like so many experimental hops liberally added late in a boil and beyond. And while the next two beers we will preview are not of either of these styles, they do feature an ingredient that is as indicative of their respective climate, carrying with them the essence of their native mountains. Upslope Brewing pays homage to the ubiquitous Douglas fir, the defining tree of the Rockies, creating a Beers Made By Walking saison with foraged needles along with orange blossom honey. 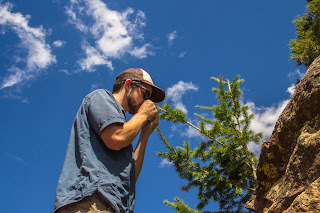 The brewery was inspired by the coniferous offerings after a walk around the base of the Third Flatiron in Boulder, a stone’s throw away from the brewery. For those who love all things pine and want to find more ways to incorporate this native ingredient into your life (aside from this beer), you can substitute rosemary with fresh pine tips or older needles (food processor or fine chopping recommended if you go this route) in your own kitchen! Not just prized for their essence, fir tips also contain high levels of Vitamin C, so they make for an excellent tea. Steep them in hot water for 15 minutes and strain for an immune-boosting beverage to ward off autumnal colds. Hailing from Asheville, NC, Burial Beer will also be serving up a saison at Beers Made by Walking. Brewed with foraged sumac from the Appalachian hillsides and locally grown and malted pilsner and rye from Riverbend Malt House, their beer "Triumph of Death" also features Cashmere hops, lemon peel and honey. 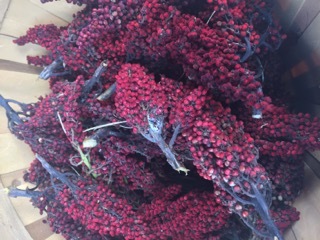 The crimson drupes, or fruit, of sumac are harvested and ground into a fine powder that lends a wholly unique tartness. It can even be used to make “sumac-ade,” a lemonade substitute. Burial's presence in Denver is a rare occasion and the Denver festival is one of the only places that you will be able to try this phenomenal brewery from NC's unique and incredible offerings in Colorado. If you can't get enough of their beer as well as TRVE's and Ratio's during the Beers Made By Walking festival at the Museum, they’ll be staging a tap-takeover at the Hi-Dive in Denver on October 5th with TRVE, Ratio and Revolution Brewing to benefit the Keep a Breast Foundation.